If I go to an immigration workers rights parade and burn a Mexican flag, I could get arrested for a hate crime. If I go to a gay rights parade and burn a rainbow flag, I could get arrested for a hate crime. But, I can burn American flags all day long. Is it only "hate" if the group is not the majority? And only treason if I kill someone? 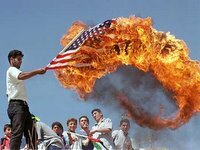 well, obviously that definition would have to picked apart, but i would have to believe that Americans burning the flag brings 'comfort' to our enemies, since it's the same thing they do to show their anger with us. That might be stretching the definition of comfort a bit far. By the way, where did you get the info on the hate crimes from? Because you're right that would be a double standard. As far as I know, "hate speech" of all forms has still been granted Constitutional protection. The question on flag burning is, how much protection does a symbol deserve (and also, how much money should be spent trying to amend the Constitution for something that rarely actually happens anymore). Steve, you're right. I can't be sure what any judge would determine a 'hate crime' to be. Intimidation falls under the definition of hate crime though, so let's just say it's a possibility. But, like you said, it's an obvious double standard, so which way do we go on it? As long as it is a peaceful demonstration, wouldn't you have to allow any of those examples under the concept of free speech? From a pragmatic standpoint, could you argue that banning flag burning would be bad apart from free speech grounds? Essentially, isn't it in some respects a way to separate those interested in serious thoughtful debate from those just trying to shock? Isn't it like holding up a sign that says "Don't take me seriously"? Uh, arrested for a hate crime for burning a flag? Not so sure about this. I think we're talking more about you kill a Mexican just because they're Mexican...that's a hate crime.